That Arne Jacobsen should draw watches was not in the cards from the beginning. Jacobsen had designed a house for H.J. Hansen, who in his time was director of Lauritz Knudsen. Hansen was so enthusiastic about Jacobsen that he encouraged him to draw a clock back in 1939. It was the first of a total of four courses from Arne Jacobsen's hand. The simple table clock from Arne Jacobsen Watches fits into any room. The watches have a design that characterizes the time - they are almost completely retro - and is a piece of design history that will add a lot of class to your home. Arne Jacobsen's table clock is updated with both alarm, snooze function and light, which is triggered by an invisible sensor at the top of the clock. 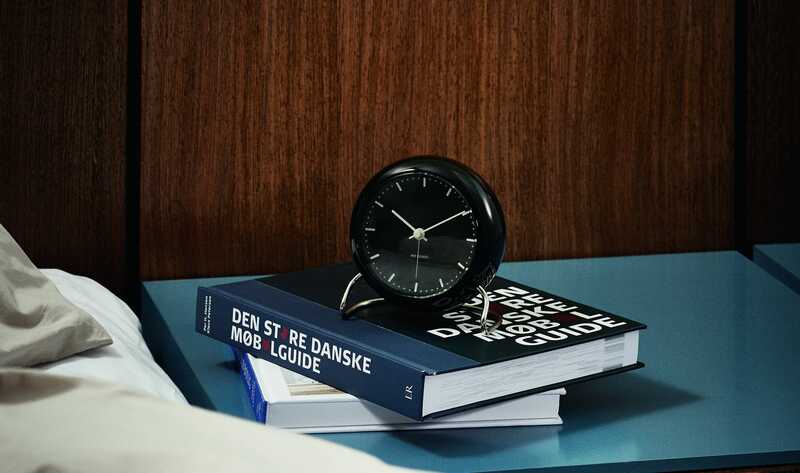 Leave the mobile phone out of the bedroom and replace the alarm clock function with a table clock from Arne Jacobsen. The clock, which Arne Jacobsen designed back in 1939, was presented at the Spring Exhibition at Charlottenborg. When the production of the original LK clock with double-pointers became too expensive, Jacobsen instead designed Station, which today is one of the best-selling products.